KUMAMOTO— I flew over on one of the new Boeing 787s, and while I appreciated the accommodate-the-human-body-and-not-a-centimeter-more seating layout in economy, I was not awed. Even though you had all sorts of technology at your fingertips: the metrics the pilot was seeing, the clipping along airspeed—550 miles per hour. The fact that you were flying six miles up and it was 40 degrees below zero outside, a few feet to the left. So interested, satisfied even. 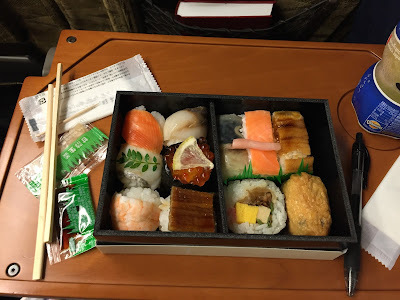 But not thrilled, not in the little boy giddy, look-what-humans-can-do way of seeing the Shinkansen bullet train pull up at Tokyo Station, of dragging my luggage above, nestling into seat, setting out my lunch, and soon clipping along at 174 miles an hour. I wish I could explain to you how Japan, whose sclerotic economy has been in the toilet for the past 20 years, can maintain this national system of sleek electric trains, while the United States of America, self-proclaimed greatest country in not just the world but the known universe too, at least according to Republican presidential candidates, can barely field Amtrak, a wheezing tortoise slowed by pain meds. I've been on more than one Amtrak train, back in the day when I would still climb aboard, where the delay was longer than the trip itself. We could never even board the trains the way they do here. "They're never going to make it," my brother says, as we stood on the platform. The digital clock reads 12:54. Our tickets say the train is to leave at 12:59. The train isn't even there yet. A whoosh of activity. Train rushes up, doors slide open, passengers stumble out, then others hurry aboard. A pause, then the train, all electric, takes off like a silent shot, sliding faster and faster. I check my cell phone: "12:59," turn it so he can see. "There goes that theory," he says. This has not been an entirely happy trip. In part because of a jet lag that never went away: many hours staring at the ceiling. But the closest I got to joy was sitting on the Shinkansen, digging into a very good box lunch, pulling on an Orangina, watching Japan flash by. The nerve-shredded, exhausted gloom lifted, for a while. Another moment was arriving at Kumamoto, the city in southwestern Japan. I'm here for the birthday party of Kumamon, the town's mascot, a Quixotic quest that should leave me giddy, but doesn't. 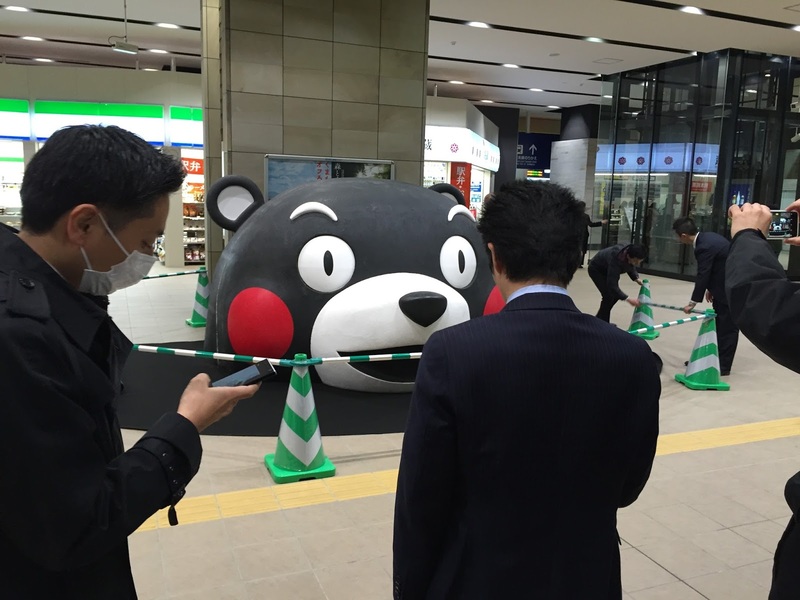 The Kumamoto platform was completely bare of the bear decorations I half expected. No banners, no posters, no photos of birthday cake. "Wouldn't it be something if I had the wrong weekend?" I thought, darkly, on the escalator, going down. "Maybe there won't be any hoopla at all." At that moment I caught a glimpse of the giant head waiting below. 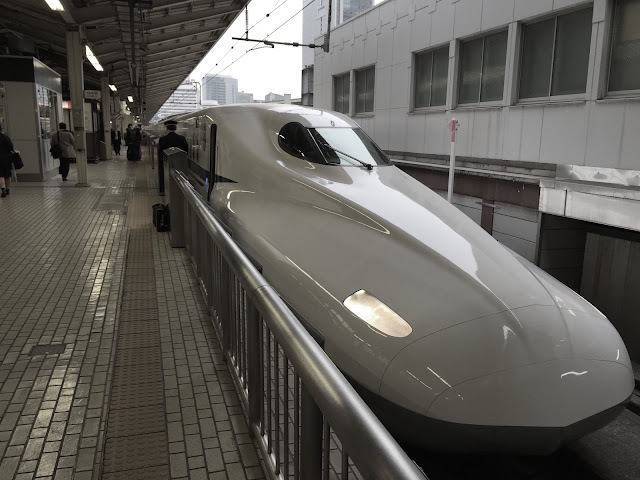 The thing that immediately struck me from your photo was not the train...which certainly looks cool...but, how spotlessly clean the train station is. Robert Reich wrote a column a few days ago, proclaiming The Donald is a Fascist. Well if Trump truly is a fascist in the same league as Benito Mussolini, as President, part of his plan to make America great again would be to have Amtrak trains run on time. But I fear Trump in this matter, as in most things, would be a third rate fascist. 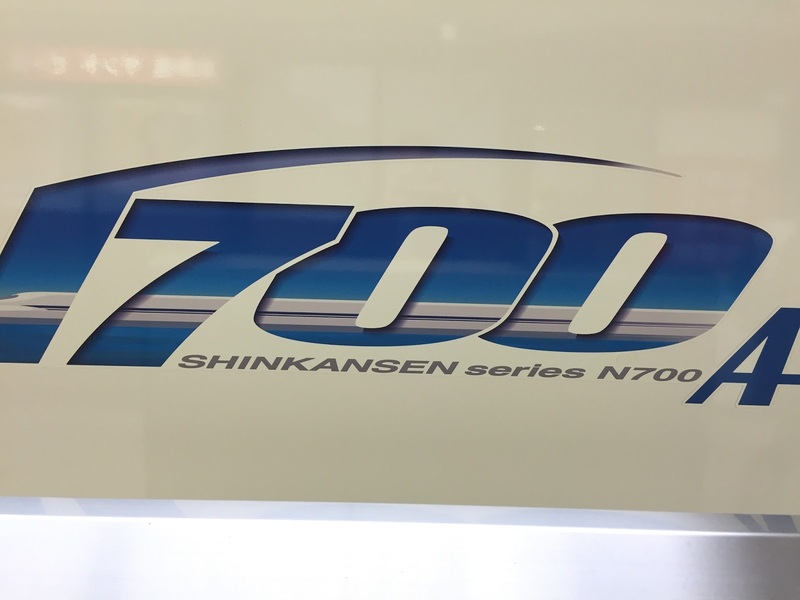 The photo of the Shinkansen is awesome!! It must have been quite a thrill to ride on it.